In Februrary 2015 the Whitworth reopened its doors to the public after a major expansion project by architects MUMA. Before building works began a 3D scan was made of the space that is now occupied by the new extension. The scan included the line of London Plane trees that flank the South side of the building. One of these trees had unfortunately died, and was earmarked to be felled. In connecting the new gallery to its surroundings, MUMA devised a system of window mullions, in angled, stainless steel that reflect the landscape of the art garden and park outside, as in a mirror. 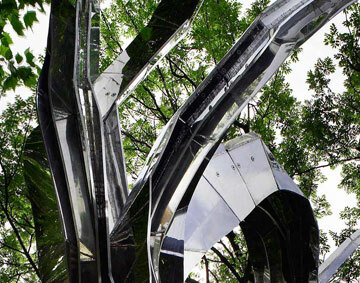 Gallaccio’s new sculptural commission will reinstate the missing tree in stainless steel, appearing as a ghostly negative form. This is the second permanent public sculpture of her career; her materials are usually impermanent and have included flowers, chocolate, fruit and sugar. Gallaccio’s practice engages with the dualities of nature and transience versus the fixed. Her work is featured in major museum collections worldwide. Anya Gallaccio was born in Paisley, Scotland in 1963, and studied at Kingston Polytechnic and Goldsmiths College, University of London. She is considered one of the foremost artists of her generation, and was nominated for the Turner Prize in 2003.